Have you ever heard of the Energy Drink Celsius? I heard about it through, well I don’t exactly remember where, people talking about it somewhere, but I was very curious to try it out since it is so different than many other energy drinks. If you haven’t heard of Celsius before here is a little about this great drink! Celsius, the Original Calorie Burner, is healthy everyday refreshment that tastes great. Celsius has been shown to burn calories by raising metabolism and providing sustained energy. Wild Berry: This drink is a purpley color with mild carbonation. It has hints of Raspberry with grape and cranberry at the end. It lightly sweetened which is great no sugary goo. Green Tea Raspberry Acai: This is non carbonated. I love the green tea flavor that it first has then you get a mild raspberry flavor followed by a great Acai flavor. The Acai really takes over and this was personally my favorite drink. But I think this flavor is one you either love or hate I personally love it! Outrageous Orange On-the-go sticks- I mixed this with my morning water and It is wonderful I love the flavor and it mixes smoothly into the water no complaints at all in fact I would probably drink this every morning! So it took me about a week to try all of these flavors! I will tell you that each time I drank a Celsius it took maybe 10 minutes to kick in but then I was hit with a great boost of energy. I had so much energy. And There were no jitters just super strong wonderful energy. I have gotten so much accomplished this week and I’m loving in. Really this drink offers a surprisingly strong boost of energy and more than I was expecting (no worries you wont be a crazy energy monster I’m a regular drinker of energy drinks and was skeptical this great drink would give me a good boost). It lasted me a about 5 to 7 hours with no horrible crashing. So you are probably wondering what is in this Drink? For the energy part, per can you have 200 mg caffeine, Taurine, Guarana, Glucuronolactone, Green tea extract, and B vitamins at the 100% rda level. Then Vitamin C, Biotin, and Chromium to speed up your metabolism. This drink is low in sodium which is so good. It comes with Extremely low calories, carbs, and sugar. It is sweetened with sucralose. 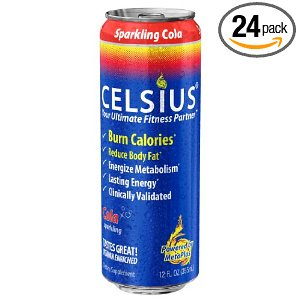 Also like I mentioned in the “about Celsius” part each can is said to be able to burn 100 calories when consumed 30 minutes before exercise, so a great tasting extremely low-no calorie/sugar/carb drink that also could help burn extra calories!!! What’s not to like!!! My overall thoughts are I love this drink and I plan on being a regular consumer of Celsius now!